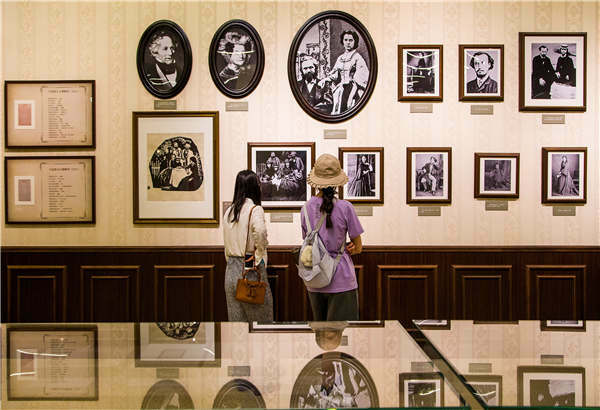 Visitors view pictures of Marx, among others, at the same exhibition that provides a comprehensive look at the life and work of the German philosopher at the National Museum of China. As events are being held to mark the bicentenary of Karl Marx's birth, The Power of Truth, an exhibition in Beijing, looks at various facets of his life. Lin Qi reports. Could a high school student's paper be an insightful one? In 1835, teachers at the Trier High School, in then Kingdom of Prussia (now Germany), received such a piece from one of the graduates-to-be. In this graduation composition titled Youths' Considerations in Choosing Occupations, the writer expressed an ambition for a job serving the people. He said if one chose a lofty career seeking the best for mankind, then, he would not be overwhelmed with heavy responsibilities, as he was making a sacrifice for the benefit of all people. The composition earned its author, a precocious schoolboy named Karl Marx (1818-83), good remarks from the examiner who said his composition was "rich in ideas, showing a deep understanding of things". It proves, after nearly 200 years, that Marx was not trading words for high marks, as he truly lived up to his high expectations for a fruitful life. In his prime, he was considered an important philosopher, political theorist and revolutionary socialist. His thoughts on communism have been put to practice around the world, and became the foundation of several communist states in the 20th century. His name evolved to be an expression of a theory (Marxism). Now, celebratory events are being held to mark the bicentenary of Marx's birth, especially in China where he is highly regarded. A work by Liu Dawei is among the paintings on Karl Marx by Chinese artists at an ongoing exhibition in Beijing. 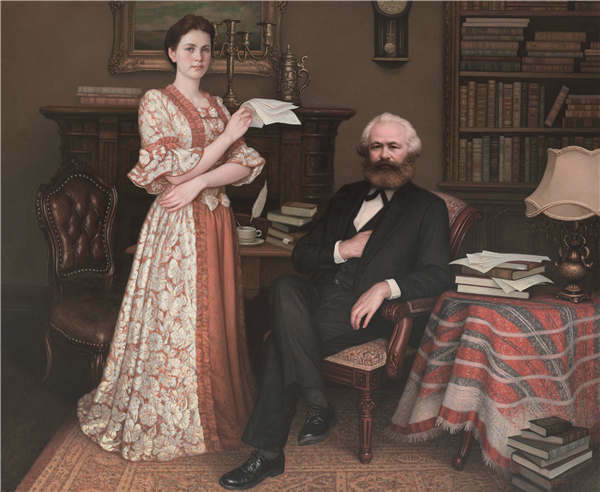 A work by Wang Nen is among the paintings on Karl Marx by Chinese artists at an ongoing exhibition in Beijing. Among them is an ongoing exhibition titled The Power of Truth, running through Aug 5 at the National Museum of China, which gives a comprehensive look at the life and work of the German philosopher, as well as how his ideas inspired the Chinese to build a communist state. Dozens of important documents are on show, including a copy of his well-rated high school graduation composition, copies of Marx's birth certificate signed by his father Heinrich, the certificate of his graduation from the University of Berlin and the cover of his doctoral thesis, The Difference Between the Democritean and Epicurean Philosophy of Nature, for which he was awarded a PhD by the University of Jena, in 1841. His work at Rhineland News was an important part of Marx's career, although it lasted only one year. There, he denounced the dictatorial regime of Prussia and defended benefits for laborers, in his writings. Copies of his articles in the Rhineland News are also on show. One section of the exhibition has copies of the Communist Manifesto published in different languages and countries over the years, showcasing the extensive influence of Marx and his lifelong companion Frederick Engels.